In 1-quart saucepan, place orange juice. Sprinkle with gelatin; let stand 1 minute. Heat over low heat about 2 minutes, stirring constantly, until gelatin is dissolved. Cool slightly. In small bowl, combine yogurt, honey and turmeric. Stir in cooled juice mixture. Cover and refrigerate until slightly thickened, 45 to 60 minutes. Meanwhile, heat oven to 350°F. Using food processor, finely crush Golden Grahams™ cereal. In medium bowl, mix crushed cereal and brown sugar with fork. Stir in melted butter until well mixed. Place cereal mixture in ungreased 9-inch pie plate. Press cereal mixture evenly against bottom and sides of pie plate. Bake 8 to 10 minutes or until set. Cool completely, about 30 minutes. Place orange segments in bottom of baked pie crust in a single layer. Pour slightly thickened orange juice mixture over oranges; refrigerate until set, about 4 hours. Right before serving, in chilled medium bowl, beat whipping cream with electric mixer on high speed until stiff peaks form. Fold fruit juice into whipped cream, 1 tablespoon at a time, until blended, taking care not to overmix. Spread evenly over top of pie. 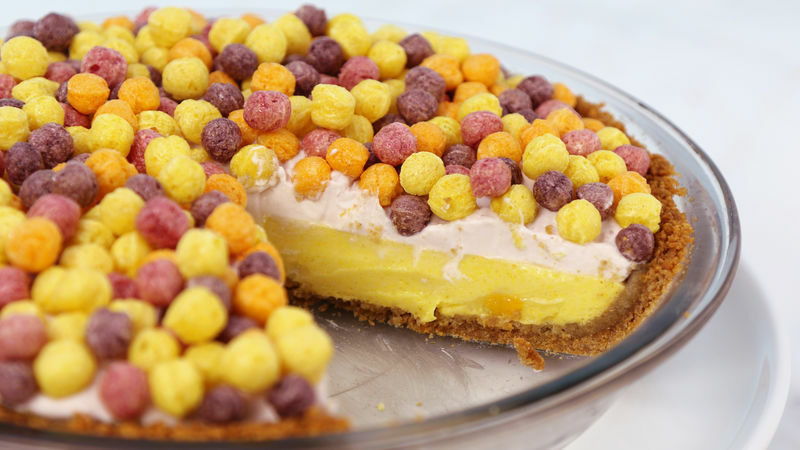 Sprinkle Trix™ cereal over pie right before slicing. Cover and refrigerate any remaining pie. Turmeric is typically a ground spice that can be found in curry powder and is a natural food color. Try your favorite fruit juice to add a new flavor twist to pie.